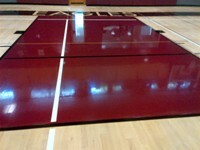 Elementary schools do not require a complex basket ball court and tend to just be the outline in a two inch line. 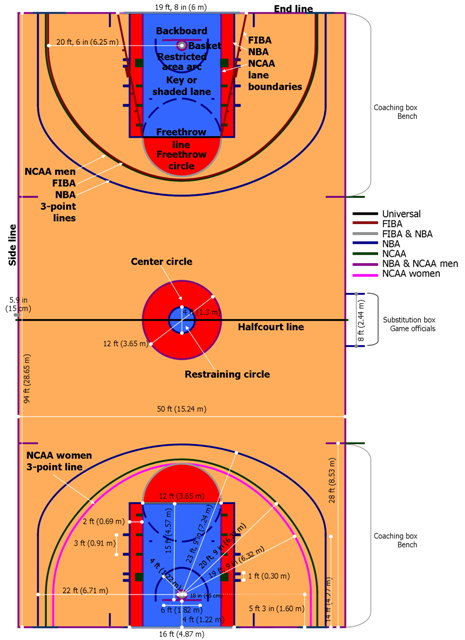 Room sizes typically are around 4000 square feet Basket ball court keys only contain three jump marks ( 7-11-14).The three point circle is what we now call the ladies standard at 6.25 meters. Overall court dimensions are slightly smaller and scaled to room size. Professional arena basket ball must be a top performer , These floor surfaces must be able to catch the foot so a player can stop on a dime, Just like a good set of Porsche tires you cant expect them to last forever and occasional recoating is recommended to protect your graphics artwork and game court markings, AHF- makes available important after sales service and maintenance on what we sell to help you keep up appearances. FIBA is larger with wider key 16ft and larger 3point circle . FIBA Click for large image. NBA click for large image. NCAA is the high school standard and also the Women's standard size. NCAA click for large image. Very easy to see the size difference to the three point circle and keys dimensions. Some options exist for the paint of the basketball keys. Create a high visibility basket ball game court by painting the entire key solid color. Graphics team emblem symbol for the centre circle Logo. 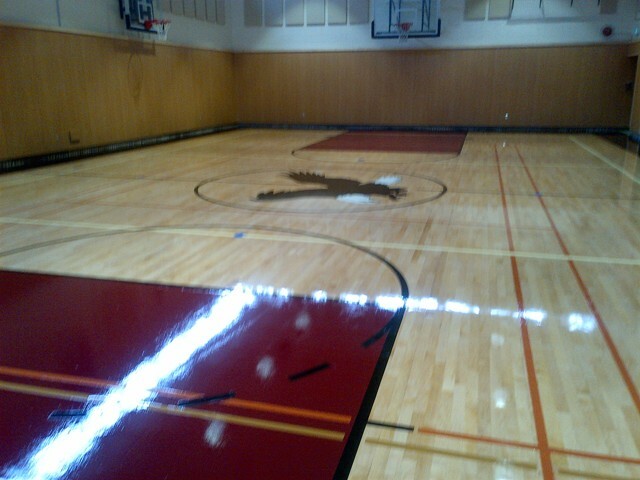 Customize your organizations home court basketball court with a team emblem or logo. 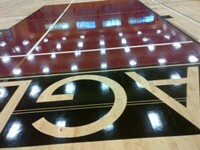 large lettering to the base banner width court outline. 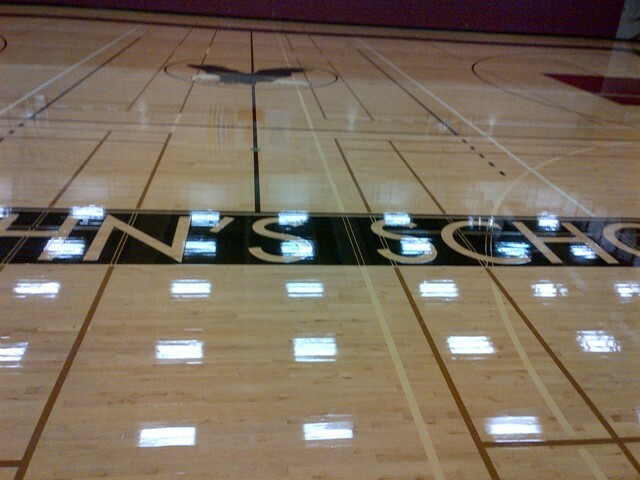 Custom banner lettering is one way to improve the appeal of a basketball court. 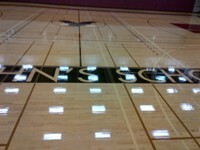 side banner lettering for the length court outline. side banners reveals give your basket ball court a enticing professional look! A real stunning spectacular visual display for your game. Other features of this photo graph are the banner width basketball court perimeters with a banner set in the three point field.The 2;; green perimeter outline of the three point circle. 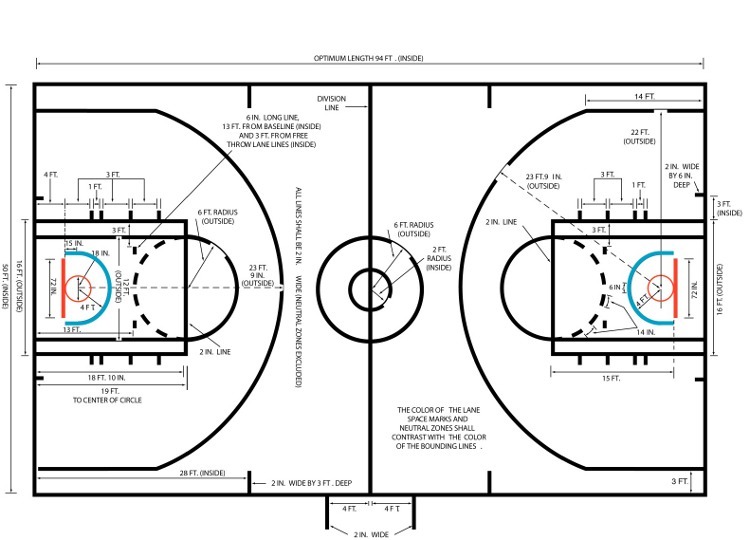 Real changes in FIBA keys with a new width of 16ft and a new no charging semi circle. FIBA KEY drawing diagram dimensions click for large image. 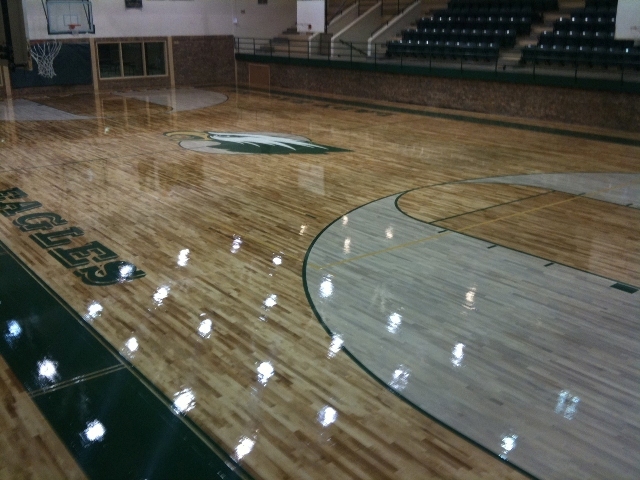 The two types of paints for wooden basket ball courts! AHF's methods are all well known and well tested throughout the wood flooring industry both painters and hardwood floor layers. Epoxy paint is a two component mixtures, a much tougher paint used on ships military vehicles the main benefit of our 2 component epoxy paint is that is is compatible with our moisture cured urethane wood floor coating. 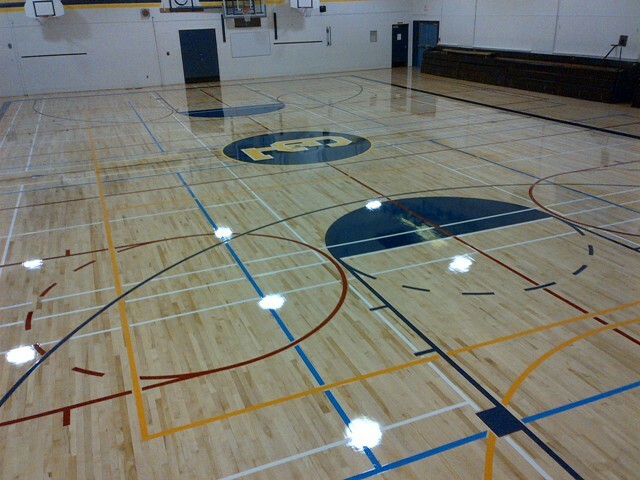 Moisture cured urethane is the wooden floor industries top performing gymnasium floor coating. This is a voluminous viscous coating with coverage's around three hundred square feet per gallon. 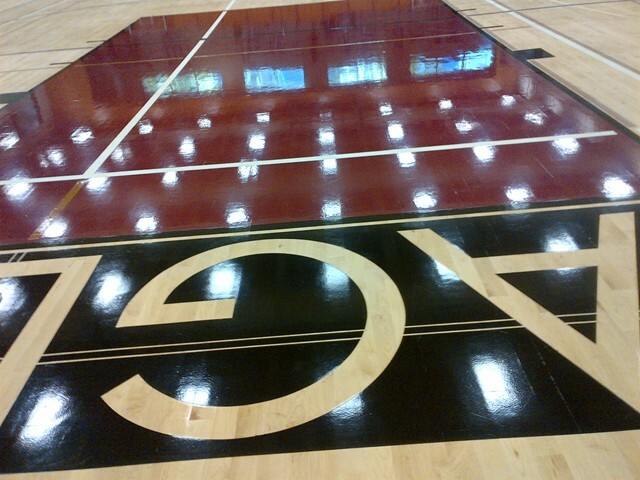 The product is full gloss tends to hold the glossy thickness look far longer than any other types of floor coatings. Our moisture cured urethane is a clearer version than that of most competitors. 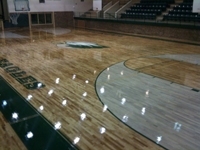 Polyurethane Wood floor coatings are the most popular because of the easy application and the cost. The actual coating itself is very good when within the first six or eight months depending on use and cleaning frequency. Polyurethane floor finish is not as tough as moisture cured urethane. poly make a nice sticky playable surface and yellowing inherently turns dark amber within a year. Professional Wood floor resurfacing service magic Vancouver BC. Hardwood flooring and stairs fashions are always in style here in Vancouver BC. Hardwood flooring comes naturally with a wide variety of color tones and grain patterns. From the very light (white or blonde) to the extremely dark (brown and black)The lighter colored Hardwoods Ash, Maple, Beach, Red Oak / White Oak Fir can be stained with a solvent based penetrating stain. Some of the stain colors are: ebony, coffee, walnut, chestnut, brown, antique, spice, golden. nutmeg, fruitwood, white , whisper grey, taupe. Grain patterns will depend on the growth of the wood trees. Some trees spiral grow while other may turn partly over their whole life. Typical versatile north American grain patterns, End grain, Rift sawn. Quarter sawn, Plain sawn..